Looking for things to do in Fayetteville AR? We have some suggestions, in fact 40+ fun things to do. You have it all here. Fayetteville Arkansas is a beautiful college town situated in the Boston Mountains, a subset of the stunning Ozark Mountains. It’s the main campus of the University of Arkansas, which is home to the famous Razorbacks (you haven’t lived until you’ve heard the fans calling the hogs during a live game). Shopping runs from trendy, upscale boutiques to national chain stores. The city is known for its unique restaurants, jumpin’ night spots, uptown area, beautiful Mt. Kessler and its many scenic multi-use and bike trails in and around the city. Calling all book lovers! 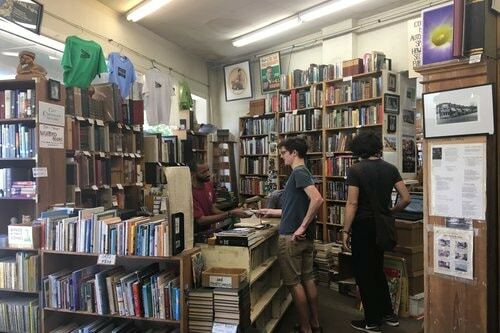 With more than 100,000 hard-to-find books, Dickson Street Bookshop, one of the best and most loved independent bookshops in the country is located on Dickson St & N School. Alternately, begin to explore famous Dickson Street or hop on one of the many beautiful multi-use trails that run through and around the city. If you’re a nature buff, stop by Fayettechill on W Dickson St, where you’ll find comfortable, cozy and long-lasting outdoors clothing. Good Things Boutique also features organic clothing and activewear. Bordinos, a Dickson Street tradition, is the place to go for refined Italian dining, wine flights, desserts and impeccable service. Mockingbird Kitchen on North College offers a seasonal menu created from Ozarks fresh ingredients. The mouthwatering, chef-made desserts are addictive, as are the signature cocktails. Theo’s Fayetteville is an upscale restaurant with a chic lounge and lively patio. Theo’s specializes in exquisite Contemporary American style food including sumptuous main plates, salads and popular share plates. Looking for additional dining options in Fayetteville? Here are the Top 10 Restaurants in Fayetteville Arkansas. 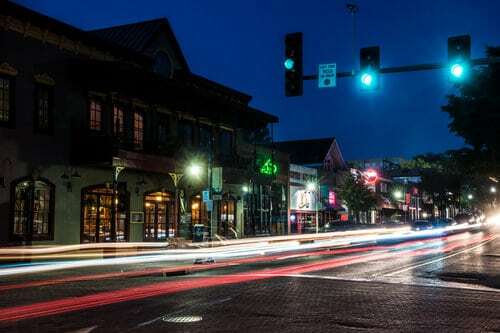 Dickson Street Entertainment District, the hyper energy heartbeat of Fayetteville is literally filled with galleries, boutiques, restaurants, bars, bistros, comedy clubs and the Walton Arts Center. Bar hopping, dancing, comedy and pool are available every night of the week. 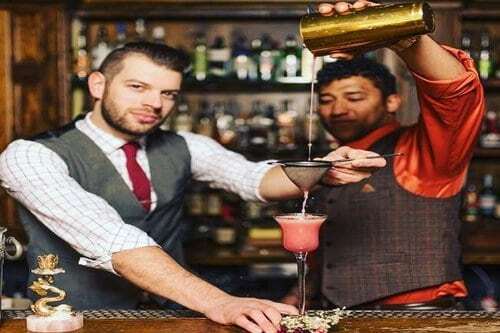 Willy D’s, C4 Nightclub & Lounge, Infusion Bar, Sideways, 21st Amendment, Ryleigh’s and Cork & Keg are just some of the many places to have a fun night in Fayetteville. If you’re hungry, stop by Shulertown, a group of fantastic food trucks located in the heart of Dickson Street. Besides Dickson, you can find a bunch of fun on Block Street. Big Box Karaoke, the Vault, Maxine’s Tap Room, and Pinpoint Fayetteville. If you love the outdoors, the multi-use trails in and around Fayetteville are second to none as is the 36-mile Razorback Greenway. 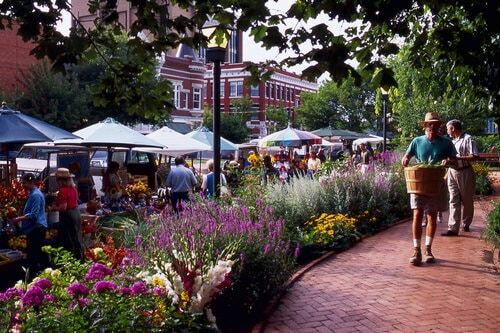 Take advantage of them, and then take in the award-winning Fayetteville Farmers Market held on the Fayetteville Square. Fresh fruits and vegetables, plants flowers, live music, crafts, art and more are displayed for purchase. From there, grab some amazing Hurts Donuts (they are screaming yummy) or some breakfast and coffee at Arsaga’s at the Depot. The crepes (the sweet ones are wonderful) are to-die-for as are their breakfast plates. The Farmer’s Table Cafe features locally-sourced breakfast plates served in a warm friendly atmosphere. Terra Studios is not only the home of the original Bluebird of Happiness, it is also a fabulous wonderland of art. Bring the family and stroll through six acres of sculpture gardens, murals, sparkling glass, fantasy creatures and fountains. Hundreds of artists have worked to make Terra Studios possible. Alternately, the Botanical Garden of the Ozarks is 40 acres of astounding beauty. 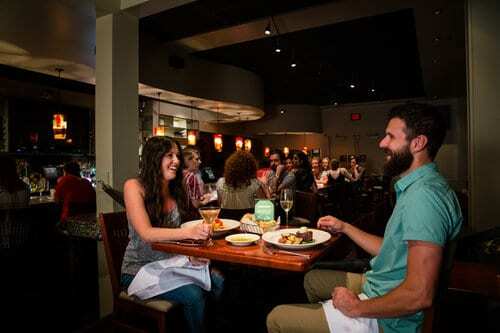 Foodies will delight at the wide variety of restaurant choices available in Fayetteville. 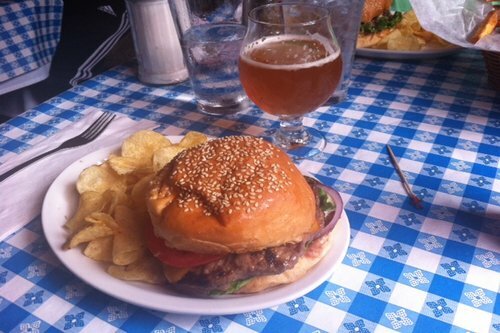 Hugo’s, located downtown and downstairs has one of the best tasting old fashioned burgers you’re likely to find anywhere. The atmosphere is lively, especially on game days. Hammontrees Grilled Cheese on N West Ave is wildly popular, and serves vegan and vegetarian gourmet grilled cheese sandwiches. There are more than 19 different varieties of cheese to choose from and you may select from the menu or build your own. Thep Thai creates and serves authentic Thai food. Everything is fresh and freshly made, the service is stellar and the staff is informative, helpful and friendly. If you really want an incredible experience check out the Food Trucks Fayetteville.. they are second to none. 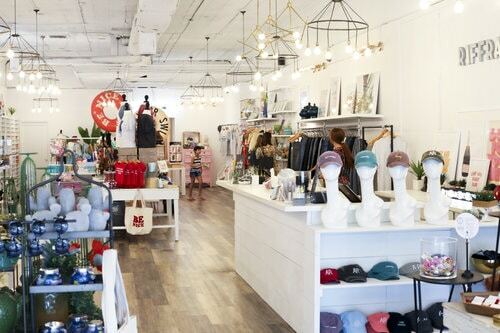 Riffraff is a comfortable, cozy boutique offering a unique selection of clothing, shoes, accessories, home goods and gifts with a unique Southern flair. You’ll find the newest trends at Riffraff. 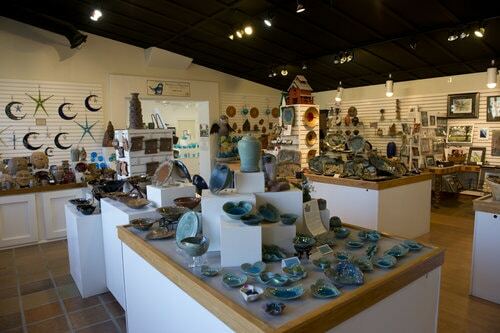 Masons is another upscale boutique featuring clothing, shoes, accessories and jewelry. Whether you’re looking for game day, casual-chic or a stunning formal outfit, you’ll leave feeling and looking like a woman of style. or… Walker Brothers, a specialty store for well dressed men, offers service beyond compare including its made-to-measure program. You’ll find brands like Vineyard Vines, State Traditions, Patagonia, Peter Millar and many more. Beautiful Lives Boutique is a stylish thrift store benefiting moms and children locally and around the world. While you’re on Dickson Street, stop in at Cannibal & Craft, Fayetteville’s smoke free handcrafted cocktail and Tiki bar. Prepare yourself to taste an amazing, perfectly mixed cocktail that is beyond delicious. Only your imagination limits your choices. Beer is also available, and the environment is smoke free. 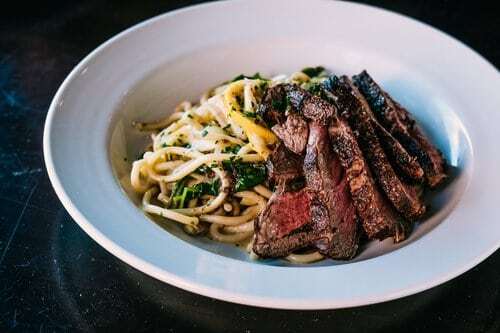 Bocca Italian Eatery & Pizzeria has a casual, upscale atmosphere and is the place to go for housemade pastas, breads, salads, sauces and wood-fired pizza. You can taste the freshness in every bite. There’s a comfortable patio and an cozy bar too where you can relax with friends or your date. Rolando’s Nuevo Latino Restaurante specializes in delicious, unique Latin inspired food including Quesadillas de Chivo (filled with goat cheese), Pollo Bohemio, Tenchas Taquitos, El Plato Cubano and much more. Service is friendly and attentive. Pesto Cafe is a small, but fun and funky Italian restaurant offering delicious dishes like amazing Shrimp Scampi and a Caesar salad that is to-die-for. George’s Majestic Lounge, in business since 1927, is the longest running club in Arkansas. 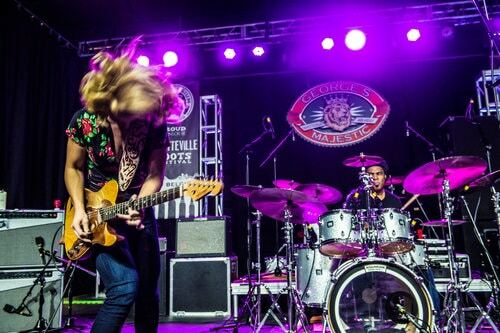 It’s a favorite live music venue, and attracts popular as well as rising regional talent. There’s tons of dance area, the drinks are amazing and the service is great too. No trip to Fayetteville is complete without a night at George’s.